So after a bit of a wait and a little drama I finally got my Lenovo Explorer. I have to say i'm impressed so far. The headset is actually quite nice and comfortable. Picture is fantastic, colors are vibrant, very nice field of view and that Screen Door effect that made GearVR look horrible is barely noticeable. The WMR controllers aren't great though. I find the button placement to be a bit awkward. But tracking has been great so far, so no big complaints here. I've only gotten a little taste as far as software is concerned. But so far everything seems to be working as intended. I even got Oculus to work with no issues so far. Once I have a better feel for what's going on I'll give some more detailed impressions. But initially, I'd say if you're on the fence about VR, WMR is a cost effective way to get into VR. Brand new headset/controller combos are selling for $200 new on the Microsoft store, I ended up buying a pre owned set on eBay for $140. The kit was in like new condition with no signs of wear at all. I'll post more as more happens. Awesome! So glad to have another WMR'er here to share info with. What do you mean you got Oculus to work, is that Oculus' house off steam or something? You can play, use, buy Oculus stuff from their store. There's a few exclusives over there that people rave about... I loaded up a couple of free-bees just to make sure it worked. No issues. That's good to know. I think there are a couple of Blade Runner experiences I want to try out. Thanks! So, a little over 24 hrs with WMR. I've probably played with it for a good 5 or 6 hrs. So What is WMR or Windows Mixed Reality? Window's Mixed Reality is Microsoft's foray into the world of VR. The "Mixed Reality" is actually a bit misleading. As of right now, there is no "mixed reality" it's 100% VR. "Mixed Reality" comes from the way the Microsoft system uses to track movement and it's controllers. Whereas the Oculus Rift and HTC Vive use "outside in" tracking, where you install these "light houses" in your play space, Microsoft chose to use "inside out" tracking where it uses a set of wide angle cameras on the exterior of the headset to track movement. If this sounds a little complicated, remember the legendary Johnny Lee and his head tracking demo using WiiRemotes like 15 years ago. The end result is that you end up with a system is that is easier to setup. Setup took me less than 10 minutes. It also gives you some portability, so if you have a gaming laptop you could travel with this kit. On the negative side, you need a well lit room for those cameras to be able to track. 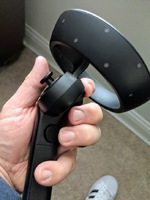 The Lenovo Explorer is very light weight and feels extremely comfortable, with one caveat. The foam portion that goes around your nose on the face mask was too dense. It only took me a couple of hours and I decided to cut a section off. I was a little concerned about light leak as a result, but I have not noticed any when the headset is on. Both the HTC Vive and Oculus Rift use 1080x1200 OLED panel displays for each eye, while Lenovo Explorer uses 1440 x 1440 LCD displays. The increased resolution is nice, but the LCDs used by Lenovo mean you may see some motion blur. On paper they're all similar in visual fidelity and I doubt you're really going to see a huge difference between one and the other. The other positive with the Lenovo is the headset is very light weight and fits ON your head as opposed to being strapped to the front of your face. You can even flip the display up if needed without taking the entire headset off of your head. Pretty cool. I wil say, due the weight difference, the Lenovo feels "less premium" for sure. I'd even say it weighs less than a gear VR if your phone is installed. On the negative side, you need a well lit room for those cameras to be able to track. Depending on your definition of well lit, I suppose. My overhead two bulb ceiling light is sufficient to run it. It's not some huge requirement, but lighting is essential for the tracking to work. Overall, I'd say the Headset is great. For the price. If you consider yourself a VR enthusiast, you might want to fork over the extra cash for a Rift... I figure this is way good for me. I've lost positioning a few times and even lost track of a controller a few times... But overall, i'd say it's good enough for me. I wonder if it has to do with light interruption. Maybe Javier has unseen interference that is negated with more "real" light? I've never seen the headset skip once it has found the room. I have seen it lose the room only if I'm kneeling down and pointing it at the floor for an extended period of time. This only happens when I'm switching someone out or if I take it off and am using the computer, but this is understandable. It always finds the room after you put it back on and look around. I guess if you are a person who is worried about light leak or something maybe that's when you'd be turning lights down? I haven't had light leak be an issue at all for me, nor has anyone else mentioned it that I let try it. I've used it with both natural and non natural lights in bright and dim rooms. Anyway for the price I don't think the headset can be beat and as Javier says it is a great way to get into VR for the budget inclined like me. I'm 1,000% percent happy with my purchase of it. If you position your hand properly so that your index finger is placed on the trigger, the trackpad is almost impossible to navigate and the button on the bottom back of the controller ends up being position with your pinky or ring finger, which aren't the most agile of the fingers. The controllers feel very light and have that "hollow toy" plasticy feel to them. Obviously less premium than what I experienced on the rift. BUT... And there's the big BUT. They work. They're bluetooth 4.0 and connect to your PC without interruption. Most games and applications I've played used the trigger and the trackpad is used as a D pad... And considering I paid roughly one third the price had I bought an Oculus Rift, I still feel great about this purchase. I'm sorry to keep throwing my two cents in here, but for the most part I have no problem with how the controllers feel or play (see next paragraph). No one who has tried mine has complained about them. I was quite surprised when my 6 year old was able to use them no problem - I thought she was going to have a tough time with how the buttons and joystick are laid out, but no issues. Same with all the other kids her age that have tried it. I have smacked them into my desk and other things multiple times and not even so much as a scratch, when I think they look halfway flimsy. I played Mordroc's Vive for about an hour or so, so that's pretty much my only comparison and that was a couple years ago and maybe I have forgotten how they felt. But again, I think the average user who has little or no VR experience looking to get into VR is not going to be unhappy with WMR as a choice, and the controllers are not going to hold them back. The one thing I will say I don't like about them is when I'm playing beat saber, the right battery cover has a tendency to slide off. So much so that I just take it off and set it down when I'm playing the game. That is annoying, and I'm considering just taping it in place. This has only been an issue so far in beat saber for me. Javier, I appreciate you keeping this discussion going and offering your honest opinions about it so people can make a more informed opinion of them. Hopefully we'll get more people to join us! I would love to see something like a button mapping database for the various games going on this forum. If you position your hand properly so that your index finger is placed on the trigger, the trackpad is almost impossible to navigate and the button on the bottom back of the controller ends up being position with your pinky or ring finger, which aren't the most agile of the fingers. OK I had to go grab my controllers. By the way, I can't see the big attachment or video or whatever it is right in the middle of your post. In reference to this part of the post, the grip button falls under my middle finger, and I have no problems pressing it. Grabbing stuff in games feels very natural. I see your picture but I'm wondering if you have really small hands or something? I can't even fit it so that my ring finger hits that button. Maybe you are choking up too much on the the controller. If I move my middle finger to the space between the trigger and grip button, it feels really awkward. I wear a medium in most men's gloves by the way. All good on opinion man. That's why we're here. I could be holding it too far forward, trying to get the right angle on on the trigger. Still getting used to it I suppose. I wear a medium to large in gloves. I have the same thing happen to me on Beat Saber as well. Only for me it was the left battery compartment. LOL. I've played a crap ton of games this weekend. I've gone through 2 sets of AA batteries on the controllers. My son (7 years old) loves the thing.